“We are in the finishing stages of a way too long project of building our own home and everything is up to current code or better and has been inspected by the county. So yesterday morning when we smelled what seemed to be an electrical fire we started to do some fast investigating. We went to the breaker panel first then the outlets and switch locations in the dinning room where the smell was the strongest. I then went outside to check the crawlspace vents to see if something was on fire under the house, and nothing. 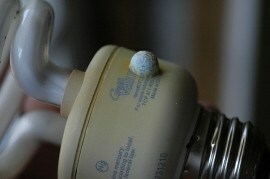 So, would the house really have caught fire or was this just the normal way for the CFL to expire? The U.S. Consumer Product Safety Commission (which welcomes product safety complaints) reports on 124 000 recalled CFLs due to fire hazard. And another case of 158 000 3-way CFLs. It is normal for some CFL bulbs to smoke a little and even show signs of melted plastic on the ballast (the plastic base of the lamp) at the end of their lives. When CFL bulbs burn out, heat builds up in the ballast and the lamp’s safety feature kicks in: the Voltage Dependent Resistor (VDR) – an electronic component that cuts the circuit (like a circuit breaker). I’m sure it’s not very healthy breathing in fumes from a smoldering or smoking CFL, even if it doesn’t catch fire!! I’d also recommend replacing CFLs before they burn out (literally) by themselves, something which you need to do anyway as they tend to get so much dimmer over time. Do a little test and remove a CFL you’ve had for more than a year (if it has lasted that long) and put in an equivalent incandescent (like the one that you had there before) or a halogen energy saver just to compare the brightness and light quality. You may be surprised! 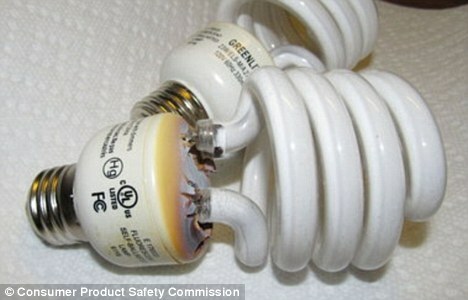 And never leave any CFLs (or halogen lamps) burning when you’re not home. What happened to the universal advice : when away from home, leave some lights on to deter burglars ? Shall we have to consent to burglaries in order to placate the Green gods ? The list of CFL inconveniences seems to be growing by the day. Certainly, this must be one of the worst “innovations” of all time. Haha, yes! The bulb equivalent of an Edsel. As seen, and as you say, even firemen services agree, and they should know! I have a house full of CFLs, have used them for literally decades and have some that are over 20 years old (used regularly). I work in the energy conservation industry and have literally seen 10s of thousands of CFLs and have yet to experience any that have started burning as these posts suggest. Dave, I agree that the CFL fire risk is probably not huge. And yes, other lamps can cause fires too, especially halogen torchiers and spotlights placed too close to anything flammable. As for standard incandescent bulbs, they’ve been used for over 100 years without problem. As for that absurd mercury claim, it was created by lighting industry lobbyists in order to try and greenwash the embarrising fact that so-called “green” lightbulbs contain something as toxic as mercury. To reduce Hg emissions into the atmosphere, the natural action would be to stop using fossil fuels. And to ban gold mining using mercury. Do you know how much mercury mining for CFLs has ruined the environment in China? Google “mercury” on this site and find out. LEDs are a better option than CFLs – IF over 12 watt, used outdoors and left on for more than 8 hours a day. But the light quality is still about 20% lower, just as in CFLs, and the mining of the rare earth phosphors needed to produce a half-decent warm-white light also ruins the evironment in Asia. Our bulbs are looking like the one in the picture above. Please do not buy thde Great Value brand at Walmart. The Sylvania ones get hot. I think I trust the old style bulbs more than the CFL ones. Absolutely agree with this! Walmart, Costco and Amazon sell loads of cheap off-brand CFLs and LED bulbs – stay away from them, they are cheap as there is no enforceable quality control on them, and often use poor components in the ballasts (which is what results in issues like the one described in this post). Buy Sylvania/Osram or GE (even though these are also made in China), something that you know should comply with standards in the USA/Canada/EU, and where you have a company that you can hold accountable locally for their product. We like to say that this was not a problem with old-style incandescent lamps, however, I recall a long discussion how many cheap Chinese made off-brand incandescent lamps did not have the little fuse at the bottom, so could also fail in ways that could cause a fire. Yes, cheap lamps, like cheap products in general, is always a problem. Quality controls are often voluntary or not done regularly enough so poor quality lamps may still slip under the radar even among leading brands, as shown by consumer tests again and again. As a rule, higher price lamps by leading brands is a safer bet if you wish good quality, although no 100% guarantee. Read consumer tests to find which models are best in any given season. We are traveling for a month. Against our better judgment we left one CFL bulb from Ikea on. 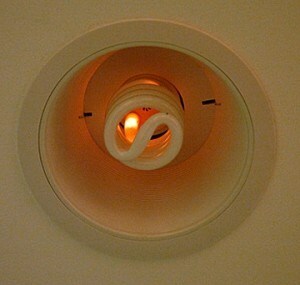 This bulb is used in a basic ikea pedestal lamp. Should we be worried regarding a fire risk? Please please advice. We are worried sick as we just purchased this new house. Our lights kept flickering and then on in our office one started acting strange. My husband tried to remove it, the bulb was not hot but the base almost burned him. We removed the bulb and things seem to be back to normal. lamp is E327386. Very scary.